An adorable and elegant cursive letter initial designed specifically for children by Tiny Blessings. That is right, it is an exclusive design you won't find anywhere else. With her beautiful initial dangling around her neck, she will feel like the special girl she is! This necklace comes with an extendable chain that offers two adjustable sizes to allow your little girl to keep wearing her precious jewelry as she grows. She will never want to part from this one-of-a-kind keepsake. 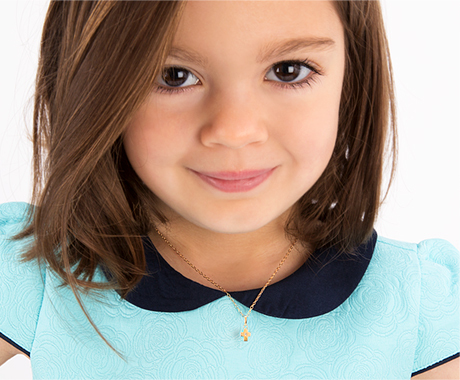 Personalize it further by adding her birthstone to make a stunning charm necklace set! Made entirely with safe, hypoallergenic, long-lasting materials, it will be a great addition to her growing jewelry collection.